There is a defective intracellular killing of bacteria (catalase positive) and fungi. CGD is X-linked (2/3) or autosomal recessive (1/3). The incidence of CGD is 1/100,000. There are defects in phagocyte NADPH oxidase (phox). - cytosolic factor p47phox is encoded by NCF1, located at 7q11.23, 25% of cases. In CGD, phagocytic cells ingest but do not kill bacteria due to failure to form oxygen radicals. PMN kills microbes by using 2 enzymes: ROS and NO. This "respiratory burst" is impaired in chronic granulomatous disease (CGD). In CGD, PMN function migration is normal bu there is no respiratory burst. CGD was first described in 1957 as "a fatal granulomatosus of childhood". CGD is a diverse group of hereditary diseases in which PMN cannot form the reactive oxygen compounds (superoxide radicals) to kill ingested pathogens. This leads to the formation of granulomata in many organs, hence the name of the condition. CGD affects 1 in 200,000 people in the U.S. and 20 new cases are diagnosed each year. 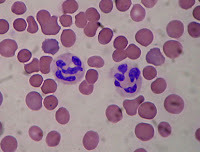 Two neutrophils (PMN) among red blood cells. PMN are the type cells affected by chronic granulomatous disease. Image source: Wikipedia, GNU Free Documentation license. Superoxide anion. Image source: Wikipedia, GNU Free Documentation license. Infections caused by catalase-positive bacteria and fungi (Staph aureus, Burkholderia cepacia, Serratia marcescens, Aspergillus, and Nocardia) are common but not streptococcal infections. The granuloma formation is due to a lack of phagocytic activity, it commonly affects GI, GU, and liver. Common infections are pneumonia, lymphadenitis, liver abscess, skin abscess, perianal abscess, and osteomyelitis. There are 2 tests to diagnose CGD. The diagnosis of CGD is based on flow cytometry (dihydro-rhodamine 123 assay) (DHR) or nitroblue tetrazolium dye test (NBT). - Normal PMNs stimulated with phorbol esters or calcium ionophore, phagocytose and reduce NBT. There are large cells with blue cytoplasm (NBT). - Unstimulated PMNs or stimulated PMNs derived from a CGD patient do not reduce NBT. There are small cells with colorless (or slightly yellow) cytoplasm. The original test for diagnosis of CGD from a historical perpsective is nitroblue-tetrazolium (NBT). NBT test depends on the direct reduction of NBT by superoxide free radical to form an insoluble formazan. NBT is a simple rapid test but is only a "yes/no" test (qualitative test) which detects whether or not there is a problem with the oxidative enzymes. It cannot provide information on how much the enzymes are affected, i.e. NBT is not a quantitative test. DHR test is preferred because it is a quantitative assay. In recent years, there has been a shift in the diagnostic paradigm for evaluation of male patients with CGD, based on the rhodamine assay. Rhodamine dyes fluoresce and can be detected easily with fluorometers. Rhodamine takes up SOD and its level is measured by flow cytometry, thus providing information about how much superoxide a patient's phagocytes can produce. 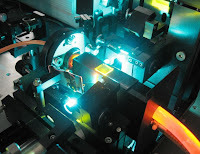 A Rhodamine 6G-based dye laser. The dye solution is the orange fluid in the tubes. Image source: Wikipedia, GNU Free Documentation license. Non-fluorescent rhodamine derivative, DHR, is taken up by phagocytes and oxidized to a green fluorescent by products of the NADPH oxidase. DHR flow cytometry quantifies neutrophil oxidative capacity. This is the most sensitive option and the most commonly used test. Phagocytic cells reduce DHR to rhodamine. Immunoblot can be used to confirm CGD: Failure to detect p47phox or p67phox. Stages 2 and 3 confirm the findings in stage 1. Treatment relies on antimicrobial and antifungal agents, followed by prophylaxis with 3 agents (TMP-SMX, itraconazole, gamma-interferon). The patients benefit from consultations with a genetics specialist for genotyping and family evaluation, and a hematologist for a potential hematopoetic cell transplantation (HCT) which can be curative. Treatment of acute infections depends on the type of microorganism involved, and relies on antibacterial and antifungal agents. Prophylactic TMP-SMX reduces frequency of staphylococcal infections, but does not affect fungal infections. Long-term itraconazole or voriconazole reduces Aspergillus and Candida infections. IFN-gamma 3x weekly also reduces infections. Interferon-gamma is used for prophylaxis but not for acute treatment of infections in CGD. BMT is with variable success in CGD since patients develop bacterial and fungal infections during chemoablation. Gene therapy is not successful in humans due to vector issues. A 2011 study reported excellent survival after stem cell transplantation for chronic granulomatous disease (CGD) (JACI, 2011). The median survival is 38 years for X-linked CGD and 50 years for AR CGD. All patients with CGD should receive lifelong antifungal plus antibacterial prophylaxis with or without immunomodulatory therapy (INF-gamma). The 3 types of interferons, remembered by the mnemonic ABG: alpha, beta, gamma (click to enlarge the image). Interferons bind to membrane receptors, which initiate the activation of Janus kinase (JAK)-signal transducer and activator of transcription (STAT)-signaling pathways. This leads to gene transcription. IFN-γ 1b (Actimmune) - Used in chronic granulomatous disease (CGD). Recombinant IFN-α-2a (Roferon-A) - Used in chronic hepatitis C, hairy cell leukemia, chronic myeloid leukemia (CML). Recombinant IFN-α-2b (Intron-A) - Used in Kaposi’s sarcoma, chronic hepatitis B or C, malignant melanoma, follicular lymphoma, and condylomata acuminate. IFN-α -n3 (Alferon-N) - Used for treatment of genital warts. Pegylated IFN-α-2a (Pegasys) - Used in chronic hepatitis B or C.
IFN-β-1a (Avonex/Rebif) - Used in relapsing multiple sclerosis (MS). IFN-β-1b (Betaseron) - Used in early or relapsing multiple sclerosis (MS). Pediatric Chronic Granulomatous Disease. eMedicine, 2010. Chronic Granulomatous Disease. eMedicine, 2012.